Looking for a fresher perspective with Feedburner email subscription form. 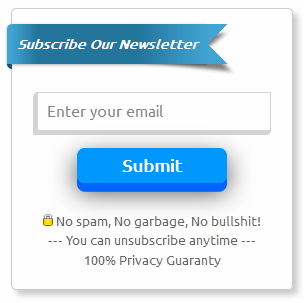 and If you really looking for; here is a neat and clean and cool Feedburner email subscription I brought to you. It's design inspired by 3D button, 3D gradient ribbons, and not to being a random looking subscription box. This Cool Feedburner email subscription form got CSS3 3D button, edgy input box, 3D CSS and CSS3 gradient ribbon, Google fonts, promising quotes! This widget also works fine on modern web browsers. So what are you waiting for let's see how it looks like, how to add it on your Blogger blog/wordpress site and how to configure. For new dashboard click on 'Text' add it to desired sidebar and paste the following codes. Go to your feedburner account and get your Feedbuner feed id should be look like this link (http://feeds.feedburner.com/your site's feed) found it! now place the feed id in 'FeedId' redcolored.